Access is currently being reopened to the areas around Winter Hill and Rivington Pike following this summer’s large moorland fire. However people are being warned to stick to the public paths over the moorlands to allow the damaged ground to recover. 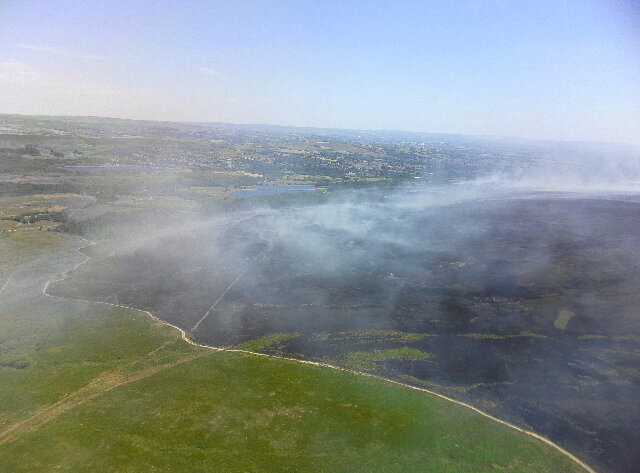 The fires which began on 28 June have been brought under control, and monitoring of the area by Lancashire Fire and Rescue Service has now been completed. Lancashire Fire and Rescue Service’s Area Manager Simon Fryer said: “Assessment of the incident ground this morning using thermal imaging showed that there are currently no hot spots presenting a risk of further fires breaking out. “As a result, the fire service will cease monitoring and leave the site in the hands of the landowners, who we have been working with throughout this incident. People are being asked to stay on the public footpaths and bridleways and avoid roaming the open access areas to prevent erosion to the damaged ground and help plant life to recover. David Goode, public rights of way manager for Lancashire County Council, said: “We’re continuing to work with the fire service and other partners to manage the recovery phase of the emergency incident, and are now in the process of reopening these areas.